dashboard: Organizing your leads, and making you more money. Time for a little-known fact: I used to sell cars. When I did, I had a box on my desk with 3×5 note cards that I kept in a small system to tell me who I was dealing with and what step I was at with them. The system was effective, but lacking. If only I could have had something like dashboard. 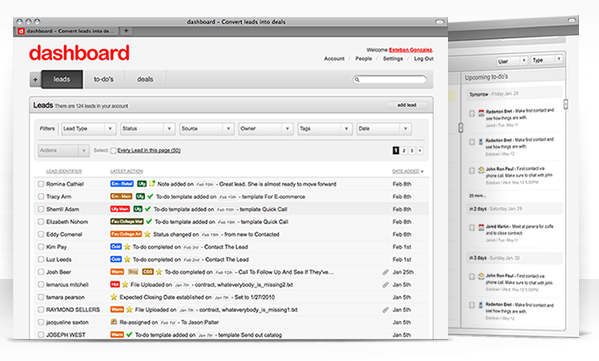 dashboard is a leads management system with a few twists that set it apart from the crowd. The ultimate goal of any leads management is to help you to turn those leads into deals. Along the way, there are generally a lot of steps, status changes and obstacles to overcome. When you’re only juggling 3 or 4 potential clients, that’s not such a huge problem. But when you get to 10, 20 or 200 you’ll spend more time trying to figure out what you’re doing than actually working. 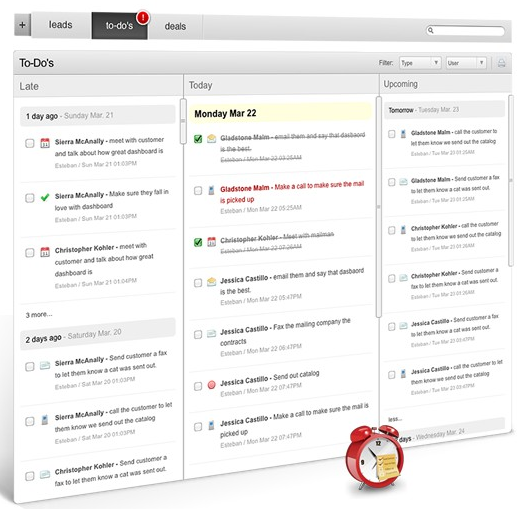 dashboard has an included scheduling and reminders interface that makes it easier to stay on top of what you need to be doing. Instead of just presenting you with a face full of leads, all at a different status, dashboard is truly smart in helping you to manage your time. dasboard makes it simple to add new leads, just by clicking the + symbol on the top left of the leads overview screen. When you do, you’re given a wealth of options for what information you want to put into the leads. The more the better, clearly, and that’s where the functions of dashboard really start to shine. If you’re thorough, and have this wealth of information, you’ll have more choices from which to pull data. dashboard is different because of its form builder. The form builder lets you sort by any or all information, and then create forms that you can set as visible either publicly or privately. So now that you’re organized, and keeping track of your leads, what’s next? The guys from dashboard tell me that an “app store” type of leads-sharing environment is in the works. Soon you’ll be able to purchase leads in real time from different areas of sales. So let’s say that I’m still selling cars, I could then choose to sell my leads to local insurance companies, providing them with accurate information on the fly. On top of the leads sharing, dashboard is also working on integration with a few other popular platforms such as Mailchimp and the Five9 dialer. When it comes to having a one-stop source for managing your leads, there simply isn’t a better option around. Read next: Awesome Proof of Concept - Azureus Rising!